John Updike reads six stories he has selected from the hundred-odd he has published. "A&P", recounting a moral crisis on the checkout counter, is his most anthologized story. "Pigeon Feathers," the longest story included, tells of a fourteen-year-old boy's fear of death and the answer he finds. "The Family Meadow" describes a piece of America, a picnic reunion in New Jersey. "The Witnesses" and "The Alligators" both deal with love, as felt by a middle-aged man and a fifth-grade boy. "Separating" recounts the June day when Richard and Joan Maple separate, in front of their four children. 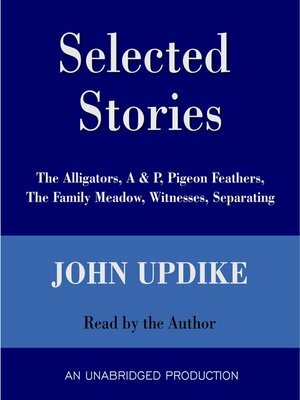 Mr. Updike, when asked to described his method of reading aloud, said "I try to picture the things describes, and to speak the words distinctly, and to let the emotion come through on its own."